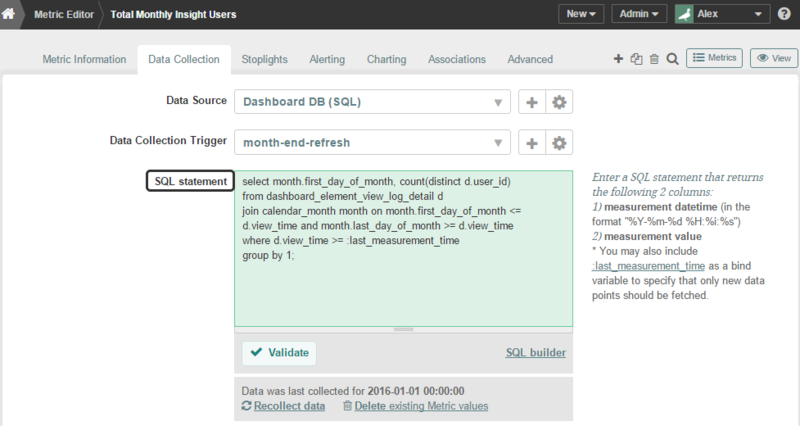 Weekly: Set to the last day of the calendar week based on the calendar week table in the Metric Insights database. The default week is Sunday through Saturday. Both of the above date/time values would be normalized to '2012-12-28 00:00:00' and the first row in the result set would be discarded (only the value of 44 would be recorded for the specified date). Both of the above date/time values would be normalized to '2012-12-01 00:00:00' (the normalized date for monthly periods) and the first row in the result set would be discarded (only the value of 44 would be recorded for the specified date). If you want to copy the required variable to your clipboard for ease in writing your statement, just click on the variable name.